Following the Hanuman Jayanti Bhandara, there will be a beautiful offering to Baba and Hanuman-ji in the new temple construction site! Nina Rao and Mirabai Starr will offer kirtan and discussion honoring the Divine Feminine. 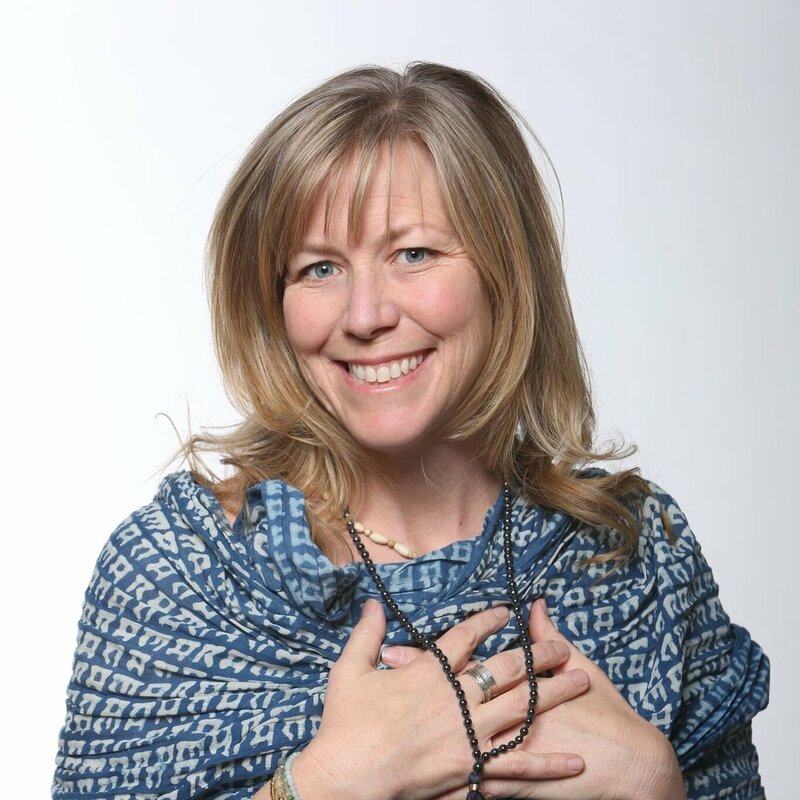 WILD MERCY: The Wisdom of the Feminine, an evening of teachings with Mirabai Starr. Nina will start the evening with an invocation chant. Nina Rao learned traditional chants (bhajans) from her grandfather in a village in south India when she was nine years old. The chants quietly stayed with her until she rediscovered chanting with Krishna Das in New York in 1996. Her childhood was spent living in and moving between many countries around the world and when she settled in New York her working life began in the banking world, switched to organizing and leading photographic wildlife safaris in Africa and India, and now for many years, is Krishna Das' business manager and assistant. Nina tours with Krishna Das, playing cymbals and singing with him, and was honored in 2013 to accompany him at the Grammy Awards webcast performance. In 2007, she recorded the track 'Nina Chalisa' on Krishna Das' CD"Flow of Grace - Chanting the Hanuman Chalisa". In January 2013, she released her debut album, "Antarayaami - Knower of All Hearts". The double CD includes devotional kirtan, bhajan, and a variety of Hanuman Chalisa melodies including a duet with Krishna Das. In 2018, Nina recorded released her second album “Anubhav". Nina regularly leads kirtan, chanting of the Hanuman Chalisa, and sings for yoga classes in her hometown of Brooklyn, NY and beyond. $25 for one event either workshop or kirtan. Cash only. After almost 2 years, we are so happy to be returning to LA's favorite kirtan gathering place! With your suggested donation of $20 you will receive a CD of my second album Anubhav released in 2018. Nina Rao learned traditional chants (bhajans) from her grandfather in a village in south India when she nine years old. The chants quietly stayed with her until she rediscovered chanting with Krishna Das in New York in 1996. Her childhood was spent living in and moving between many countries around the world and when she settled in New York her working life began in the banking world, switched to organizing and leading photographic wildlife safaris in Africa and India, and now for many years, is Krishna Das' business manager and assistant. Join Nina Rao in the ancient bhakti yoga practice of kirtan - call-and-response chanting. Bhakti is devotion - devotion to the Love that connects us all. The repetition of the Divine Names accompanied by music with a group of like-minded seekers helps each one of us to quiet the mind and open the heart. The chants are meditative and prayerful and invoke the deep space of well-being that is within each one of us. No experience is required and word sheets will be provided. TRANSFORMING ADVERSITY INTO THE PATH: FEEDING YOUR DEMONS® WORKSHOP with Chandra Easton. Tulku Sherdor, Krishna Das, Nina Rao, Keli Lalita, and Lee Mirabai Harrington will share the sacred space of the shrine room at Blazing Wisdom Institute. In this unique online event, each of them will lead a chant or two and you are welcome to join in remotely and share in the chanting. Mark you calendars to tune into TULKU SHERDOR Facebook page where the chanting will be live-streamed. DETAILS will be posted HERE soon. Join us as we welcome back Nina Rao to lead us in chant for an evening of soul-stirring and meditative melody. Come join us for this lovely evening of kirtan - call and response devotional singing. In this unique offering, Nina and Devadas will explain the history of kirtan and intentions behind the chants, with singing and time for Q&A. For everyone; no chanting experience required. Take time out to retreat into the hridaya, the cave of your own heart, and create a sustainable personal practice that fits into your daily routine. Word sheets are provided, as well as reading and audio lists for support after the retreat. Come spend time with like-minded seekers and practice together as you strengthen your own practice and find that inner place of refuge to which you can always return. Free for program participants and in-house guests; no general public tickets available. Bringing Chanting Into The Practice of Living. As we give ourselves to the practices of chanting, mindfulness and lovingkindness meditation, our habitual patterns of attachment and separation are seen for what they are: painful and unnecessary. Through these practices we can begin to live in a way that is commensurate with our extraordinary potential– the potential of being truly awake. We ourselves can live with the unbounded heart of the Buddha. In this weekend retreat, dive into the practices and teachings of the unbounded heart, led by lifelong teachers and friends, Krishna Das and Sharon Salzberg in Phoenicia, NY at the Menla Mountain Retreat Center.. Sharon and KD draw from their respective traditions of Bhakti Yoga and Buddhism for a complementary exploration of the heart as wide as the world. This immersive retreat includes periods of teaching, discussion, guided meditation, call and response chanting practice, as well as time for question and answers. The weekend also includes group chanting of the Hanuman Chalisa led by Nina Rao, and daily yoga classes led by Lily Cushman. Suitable for new or experienced practitioners. Imagine floating quietly in an ocean of soft vibrations and lapping waters. As you drift into peace and bliss, you feel yourself cradled by the divine ocean and carried safely home. Like being held by the waves of a serene ocean, chanting the names of the Divine reveals your effortless ability to quieten your mind and open your heart. It brings you home to your truest self, the part within you that dwells in stillness and grace. Repeating the names of the Divine not only steadies the mind, but also allows thoughts to fall away as you become more heart-focused. Relax into spiritual chanting with a special emphasis on the Divine Feminine and the Hanuman Chalisa. No musical experience is required for you to experience this tranquil atmosphere of devotion. Allow your spirit gently to awaken … and let the healing begin. Our beloved Sri Siddhi Ma didn't like a lot of fuss made about Her but we'd like to honor Her in a simple way on the anniversary of her birth/appearance with a little bhajan and bhojan. This day is celebrated as per the Hindu calendar of Chaitra Navratri, the sacred 9-night festival in the spring. Join us for an evening of kirtan - devotional call and response chanting. Hindu Buddhist Paths of Devotion: Cherishing Divine Wisdom and Compassion Through Chanting and Mantra. In these three sessions, we will chant together, mantra together, teach and discuss wisdom and love and compassion in the tradition of Krishna Das’ Guru, Neem Karoli Baba, and HH the Dalai Lama, and have a great time, invoking Noble Tara, Shri Devi, Krishna/Radha and Manjushri/Sarasvati, covering the Guru-disciple relationship and its permutations, all kinds of mental and physical yogas, mind-concentration and heart transformation, bhakti and Tantra, etc., and basically enjoy the beautiful Dharmas of India and Tibet. Krishna Das’s longtime assistant and accompanist, Nina Rao, will lead a chant or two. Nourish your heart, inspire your mind, and uplift your spirit through chant, music, and devotion. Krishna Das shares the heart of his spiritual practice through his concerts and workshops, using the power and joy of chanting to lead you into your inner heart space. Join one of the foremost devotional singers in the world for evening kirtan concerts and afternoon workshops with musical prayer and teachings on Bhakti Yoga, the yoga of devotion. As a special treat, Nina Rao will share her rendition of the Hanuman Chalisa. This annual event at the ashram always sells out — be sure to register early. Please note this event is SOLD OUT. Contact the ashram directly for accommodation suggestions and options. Join Krishna Das for a weekend retreat of yoga, chanting and devotional heart-opening practices. This is a wonderful opportunity to spend time with a group of dedicated seekers and immerse yourself in practices, teachings, and discussions. The retreat program consists of evening kirtans and afternoon workshops. Kirtans are approximately 2.5 hours of call-and-response chanting with musical accompaniment and workshops are approximately 3-4 hours of call-and-response chanting, talks about the spiritual path, and a forum for questions and answers. There is the option of registering for 3 nights (Thursday evening to Sunday morning) or 2 nights (Friday evening to Sunday morning). On one day, Krishna Das will be joined by Lama Surya Das, who will share his experiences as a Buddhist teacher and his experience with Maharaj-ji Neem Karoli Baba’s darshan. Group chanting of Hanuman Chalisas with Nina Rao is also included in the program. This is an opportunity for beginners and experienced chanters to chant this 40-verse prayer in praise of Hanuman as a group. The prayer is from the Hindu tradition, wherein Hanuman is invoked as the very breath of the Divine – our own Divine nature. Many believe that chanting this prayer gives us the strength to get through difficult times with compassion and grace. Word sheets will be provided. No experience necessary. There will be some extended chanting sessions included in the daytime programs over the weekend. Yoga classes with instructor Jill Ganassi will be scheduled into the weekend. PLEASE NOTE: There are two options for this retreat. If you wish to attend the full retreat from Thursday to Sunday, please register for the full price rooms to reserve your space. If you wish to attend from Friday to Sunday, please register for the the partial retreat. Start the year with the annual group chant of 108 Hanuman Chalisas. It is a free event and no experience is required. Chant sheets are provided and please bring vegan prasad if you would like to offer. Join us once again for this benefit event in support of Ganga Prem Hospice Rishikesh, India. Krishna Das will perform live at Swami Swatantranand Ashram on Dec 30 at 2pm local time. Join Bill Mahony and Kenny Graham as they co-teach and skillfully weave their teachings into a fabric of full experience; bhakti philosophy, energetic & yin asana, meditation, and kirtan. Discussions and practices in this urban retreat will focus on some of the characteristics and possibilities of a yogic life illumined and supported by spiritual love. It will be a full and inspiring weekend woven with various threads. Bill Mahony will lead us in reflecting together on selected passages from the Bhakti Sutra in a spirit of satsang as well as share stories of Krishna, who is understood to be an embodiment of divine love. Kenny Graham offers a form and flow vinyasa and Yin Bhakti infused yoga retreat weekend exploring seeing our bodies and minds as they really are in relation to our world and our yoga. At a deeper level, direct personal experience will lead us to the center of the Heart. Right Intent for the practice must come from the heart and involves recognizing the equality of all life and compassion for all that life, beginning with yourself. Join Nina and friends Daniel Johnson, Keli Lalita, and Noah Hoffeld for a night of kirtan/chanting. Hi Y'All I chanted at this festival last year and loved the vibe of everyone doing practice. This year I'll lead a Hanuman Chalisa workshop midday on Saturday November 3. Krishna Das sings at night. Look forward to seeing you there. Welcome to an extraordinary experience for lovers of Yoga, seekers and teachers alike. Get away to the peaceful Catskill Mountains to enjoy amazing sacred music, incredible classes and workshops taught by highly sought after teachers and delicious healthful fare. Your day may include a meditation hike on the mountain, ecstatic late night dancing, your favorite style of yoga practice, or learning new techniques for blissful living! Ahimsa Yoga & Music Festival invite you to expand your community and enjoy a weekend journey filled with surprises ! Picture yourself in a theater filled with people connected through music and the practice of meditation and chanting. Now, get excited because we’re screening the award-winning documentary Mantra – Sounds into Silence at the United Palace on October 27 at 7pm, followed by short live kirtan by Grammy-nominated Kirtan artist Krishna Das, accompanied by Nina Rao. Presented by the United Palace, Kirtan Wallah Foundation, and Call and Response Foundation. Join Nina and her chant friends Daniel Johnson on tabla, Keli Lalita on kartals, Eric Fraser on bansuri, and Noah Hoffeld on cello at Sondra's sweet satsang space Sadhana Center for Yoga and Meditation for a night of kirtan/chanting. Extra Extra! Edwin Bryant will be teaching at Sadhana on Fri and Saturday - so you can make a weekend bhakti immersion for yourself! NAVRATRI is an annual Hindu festival that takes place over 9 days and nights in the Fall. Also known as Durga Puja, this festival honors nine distinct aspects of the divine feminine, in particular SARASWATI, LAKSHMI and DURGA -- symbolizing the triumph of light over darkness, and illumination over ignorance. In India, this festival is a time of ceremony, reflection, celebration, community and practice. Puja ceremony led by Priest Prakash with dedications to Ganesha, Durga, Lakshmi and Saraswati. Group kirtan with call and response chanting celebration the divine feminine led by Ambika, Lily Cushman, Nina Rao, Shyama Chapin, and friends. Abhaya Gowanus and Community invites you to a monthly Sunday Night Satsang. Satsang means to “come together in Truth”. Coming together with a like-minded community can provide support and strength individually and collectively. We invite you to bring your favorite (vegetarian/vegan dish). At this Satsang Nina will lead kirtan and we will share in Dharma discussion. Tara Glazier will lead very light movement-into-meditation. The Dharma talk will set the mood for the evening and give us opportunity for reflection and discussion. Join us on this community centered night to relax into good company and good food! Let us know if you are coming by indicating GOING and if you will bring some food to share - doesn't have to be fancy, just simple. It will be nice to see everyone and start the new week ahead of us. I'll have my new CDs with me as well. Festival of music, chanting, yoga, meditation, self-care workshops, and the beauty of the desert. See details at Bhaktifest.com. I'll be leading Hanuman Chalisas 8am-9am Fri, Sat, Sun and kirtan on the mainstage Fri 1pm-2:15pm. * I have 4 discounted tickets, which if you purchase from me, directly goes toward supporting the musicians who play with me. Please email me at chant@chantkirtan.com to get your ticket. Thanks for your support. Starts Tues. 11:00 a.m. and ends Tues. 5:00 p.m.
For information and tickets – eomega.org/workshops/heart-practice-of-chanting-1. Remarks: We spend the morning exploring the spiritual path with group chanting of Hanuman Chalisas with Nina Rao. Guided by Krishna Das in the afternoon we chant, play, talk, and have plenty of time for Q& A. An evening of chanting with Nina Rao. No experience is necessary! Join us for a lovely evening of yoga and chanting at Solid Gold Yogi. Nina will play live accompaniment during a 90 min Jivamukti yoga class taught by Tiffany with hands on assists by Leslie, followed by a short call and response chanting practice with Nina. Whether new or experienced, all are welcome. Yoga will be taught by my dear friend Keli Lalita Reddy. Come join us for this lovely evening of Kirtan- call and response devotional singing. In this unique offering, Nina and Devadas will explain the history of kirtan and intentions behind the chants, with singing and time for Q&A. Come start the weekend with an evening of chanting. By donation at the door. I will be opening this evening with a chant and introduction to Lama Tsultrim. This evening talk is based on Lama Tsultrim Allione’s new book: Wisdom Rising: Journey into the Mandala of the Empowered Feminine. A dynamic spiritual model based on 1000-year-old tradition from Tibet meets the gale force winds of the current world situation. She masterfully shows us the secret to harnessing the energy of the fierce wise dakini a previously forbidden aspect of the feminine, whose juicy potency is so needed now. Through the Dakini Mandala, a universal template of wholeness, each of the five dakinis, embodiments of the fierce feminine, transforms an emotional encumbrance into wisdom. The mandala brings strength from the inside out giving a practical method to become an effective agent of transformation in your world. After an introduction to the mandala and the dakini principle you will be guided in a short experiential journey into the mandala of your innermost being, where the empowered feminine resides. Your ticket includes a copy of the book & an opportunity to have your book signed by Lama Tsultrim Allione. Nina will be leading chanting of the Hanuman Chalisas as part of this retreat. Join Ram Dass, Krishna Das & Friends to Spring on Maui to renew, refresh and revitalize in paradise at the picturesque Napili Kai Beach Resort. You are invited to renew, refresh and revitalize this spring on Maui. Start each day with sunrise silent sitting mediations with Rameshwar Das. Daily LIVE Music Yoga Experiences with Saraswati Markus or enjoy Qigong on the Lawn with Joyanna Maria. Surf the Silence in Mornings of Meditation & Dharma Talks with Roshi Joan Halifax of Upaya Zen Center and Frank Ostaseski of Metta Institute. Special guest Robert Thurman of Tibet House. Daily insights, laughs,reflections, contemplations and words of wisdom moderated by Raghu Markus / Be Here Now Network with Ram Dass andFriends. Nightly kirtans and “stories from the spiritual path” with Krishna Das. Soar in the spirit of Aloha with pule (prayers), blessings and ceremony by Lei’ohu Ryder and Maydeen ‘Īao of Aloha in Action. Delicious, healthy meals, served buffet style, by the award winning Sea House Restaurant. Vegetarian, vegan, gluten free, non-dairy options available at each meal. Relax, bask in the hot tubs, enjoy impeccable ocean swimming, snorkeling with turtles, delightful ocean front hiking trails and epic sunsets, while on retreat this Spring on Maui. An evening of contemplation and music to benefit Still Waters in a Storm and Mission 22. Featuring readings and conversation with Sharon Salzberg, author of Lovingkindness, and Susan Cain, author of Quiet and a keynote speech by Bob Kerrey, former United States Senator, Governor and veteran of the Vietnam War. The show closes with music by Dar Williams, guided meditation led by The Big Quiet and chanting by Nina Rao, accompanied by cellist Noah Hoffeld. Still Waters in a Storm is a one-room schoolhouse, a reading and writing sanctuary for immigrant children ages 5-17 in the neighborhood of Bushwick, Brooklyn. The structure of our meetings is the same in English, Spanish, Latin and Musical Notation: children and grown-ups study a text together, each writes something inspired by the text, then they take turns reading their writings out loud while everyone listens in a sacred hush. The one rule is, "Everyone listens to everyone." The simple grace of this ritual changes lives for the better. Mission 22 is a non-profit who combats the ever-rising veteran suicide rate. Every day, more than twenty veterans are lost to suicide. Mission 22 wants to bring that number to zero. It does this with three main programs; veteran treatment programs, memorials and national awareness. Mission 22 provides treatment programs to veterans for Post Traumatic Stress, Traumatic Brain Injury and other issues they might be facing. It organizes events and builds memorials to create social impact and awareness for these issues. Mission 22 also has an Ambassador volunteer program for people to get involved as well. Ambassadors educate the public on veteran issues, help get veterans into Mission 22 treatment programs and create resources in their communities. Through these three programs, it enables a push for the betterment of our nation's heroes and stands united in the war against veteran suicide. Special Note: We invite you all to use the "student" ticket buying option for this event, which will allow you to purchase a ticket at a discounted student rate. Please join me for this film screening about Chanting at the Rubin Museum of Art. I'll be doing a live chant after the screening on Sunday March 18. Get your ticket, bring a friend to the Rubin's intimate theater for movie and live kirtan with me! Dive deeper into the essential teachings of Ram Dass, while connecting with loving satsang and enjoying many heart opening practices. Daily dharma talks, meditations, and workshops with Mirabai Bush, Nina Rao, Saraswati Markus, and friends. Baba Ram Dass will teach via Skype in various sessions. Daily yoga with Saraswati and nightly kirtan with Nina Rao and friends. Organic, vegetarian meals featuring seasonal, locally grown produce, mindfully prepared by chefs from Food Harmonics. We have room blocks at the Pepper Tree Retreat, Ojai Rancho Inn, and Hummingbird Inn. Call these hotels directly to reserve your room, mentioning you're part of the Ram Dass retreat room block. If you'd like to share a room or transportation with another participant, you're encouraged to do so! Use this event page to connect with other retreat attendees to find a roommate, make carpool arrangements, etc. Feel free to post questions and start dialogue with other attendees. * There is limited space on-site at Hanuman Gardens for tent camping. BYO gear. Also a few parking spaces available for those wishing to stay in their camper vans. First come, first serve basis - to reserve your tent or van camping space, email Maegen@HanumanGardens.com. Retreat cost: $750, including all meals from dinner Thursday, March 8th through dinner Sunday, March 11th. 2 day weekend passes are available for $400. Total retreat headcount won't surpass 100 folks, so register early to ensure your spot. Hotels in the Ojai Valley fill quickly, so act soon if you'd like to book lodging.